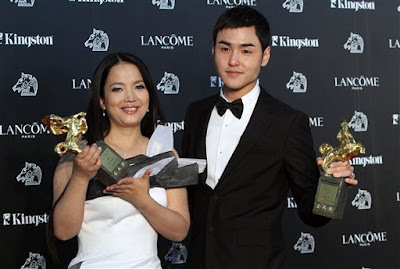 Today in Taoyuan, northern Taiwan, the 2010 Golden Horse Film Awards for Chinese-language films were handed out. Taiwanese indie films dominated the evening, as the family drama When Love Comes won Best Feature Film in addition to Best Cinematography and Best Art Direction. Taiwan's Chung Mong-hong won Best Director for The Fourth Portrait which also won Best Supporting Actress and Outstanding Taiwanese Film of the Year. Taiwanese gangster film Monga won awards for Best Leading Actor, Best Sound Effects and Outstanding Taiwanese Filmmaker of the Year. The gay romance from China, Spring Fever, won Best Editing and Best Original Film Score awards. Legendary martial arts action star Sammo Hung won Best Action Choreography for Ip Man 2. This is the 47th edition of the awards which are given by the organization which also hosts the Taipei Golden Horse Film Festival and which honours Chinese-language films from Taiwan, China (including Hong Kong and Macau), Malaysia and Singapore. Previously, the Golden Horse Film Awards excluded films from mainland China, but began allowing them in 1992 after a protest by famed Australian cinematographer Christopher Doyle (Hero, In the Mood for Love). Winners are decided by a jury of filmmakers, academics and artists. This year's jury consisted of Ho Ping, Lee Fu-Shiung, Chiang Hsiu-Chiung, Michael Berry, Lau Chia-Hua, Shum Long-Tin, Zhang Yuan, Kuo Li-Hsin, Chen Lo-Jung, Tseng Chung-Hsiang, Shu Kei, Edmond Wong, Yang Li-Chou, Cecilia Yip, Ning Hao, Liao Pen-Jung and Patrick Tam Ka-Ming.